Is it a strictly American trait? Or is it the same for fighting men worldwide: when the fighting is over, or even in a lull, they start looking for souvenirs. And sometimes do so to amazing extremes. Most of the time, this souvenir addiction only comes to light when we find a German Mauser or Japanese helmet in the closet after Granddad passes. However, on these pages, we have graphic evidence of the extremes to which young GIs, thousands of miles from home, isolated on an obscure Pacific Island went on their urge to bring something home that would forever link them to what was probably both the best, and the worse, times of their lives. The circumstances of how Japanese Zero, 8-13, came to be damaged and abandoned on Saipan, are unknown. However, casting a forensic eye on the tiny photo of it while still intact makes it look as if it was damaged on landing. The folded left wing indicates a possible ground loop. 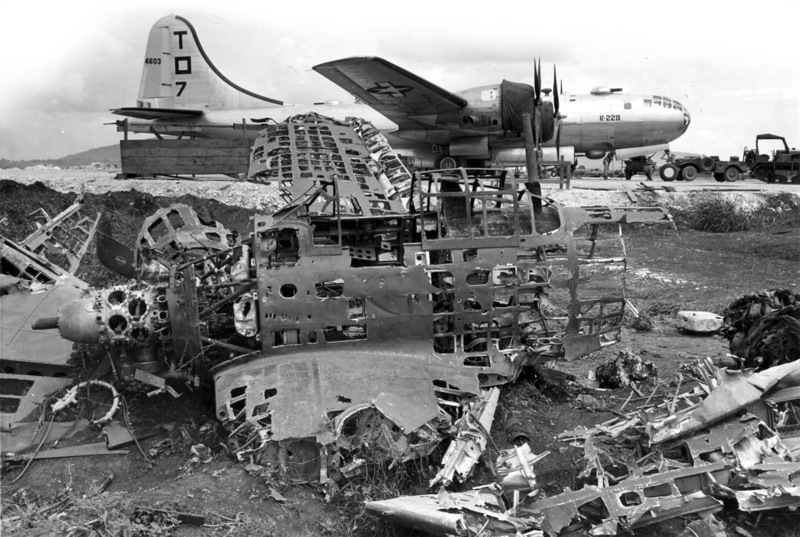 However, as B-29 SN42-24603 (498th Bomb Group, Saipan) is prepped for another mission to pound the Zero’s homeland, at a casual glance, it appears as if 8-13 has been in a fire: when all of the aluminum skin is missing between the heavier structural members of an aircraft, it is usually a guaranteed indication of fire, the much thinner skin melting before the heavier structure. However, in this case, closer examination says something entirely different. Look closely at each hole in the structure: the edges of the holes are clean. Almost surgical, not melted back. Then, and it’s hard to see in the photo, look in the fuselage just above the left wing root: examination with a magnifying glass shows a series of regular, triangular holes, consistent with the shape of a bayonet or combat knife: someone had been trying to remove that section of skin but the framing members stopped all progress. Also, note the rectangular section of the left canopy rail and upper fuselage skin that’s been excised. Careful examination of the small photo of the intact airplane shows that there was likely some sort of insignia or writing at that location but that section of Mitsubishi’s pride made its way back to the U.S. in some GI’s duffel bag. One of the reasons an airplane would sometimes be so completely decimated by souvenir hunters had to do with the local detachment of Sea Bees. These amphibious engineering units had complete machine shops to maintain their heavy equipment and much of their spare time was spent making combat knives for the GI’s. Beer rations and combat souvenirs were normal pay. A favorite version of what are now called “theater knives” (which were made by the thousands in every combat theater, each different from the next and are now serious collector’s items) had the blade formed from something like a Zero’s propeller blade, the handle a stack of thick, circular, clear plastic wafers cut from the canopy with layers of thin aluminum skin between them for accent. The brass guard was usually cut from the thick base of an artillery shell. 8-13’s engine has been completely disassembled with pistons and cylinders undoubtedly becoming lamp bases and paperweights. No removable part of the airplane was wasted and they are now scattered throughout dens, attics and garages in unknown parts of the world. Saipan was a bloody campaign in which 3,500 U.S. troops and 29,000 Japanese died. Many more American servicemen proved their mettle and earned the victory. Body parts of Mitsubishi Zero-sen 8-13 serve to remind those who know the origin of the odd artifacts left to them by their grandfathers of the sacrifices they made in the name of freedom.